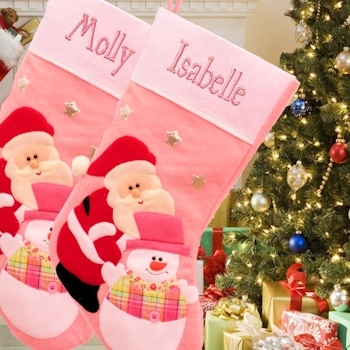 Personalised pink Christmas stocking with traditional Santa and snowman scene. Personalised pink Christmas stocking with traditional Santa and snowman scene. Silver stars and plush festive characters feature on this pretty pink stocking. Beautifully decorated Christmas stocking in pink and white with a made from thick sturdy felt. Personalised with a name embroidered on the cuff in shiny pink Xmas Print or Fancy Script font. Stocking size 50cm diagonally top to toe, 22cm diameter cuff.